Cassiopeia A double layer explosion. Image in twelve-times ionized silicon light. Phenomena and their explanations are moving targets. What’s considered to be a phenomenon changes over time and requires a new explanation. If an explanation lasts long enough to enable us to do something with it, it’s a good explanation. Often the explanation will contain the seeds of its own overthrow: it will enable us to make new instruments and observations that contradict the explanation and reveal the phenomenon to be something other than what we considered it to be. The nature of considering—the ways that nerve activation evolve in our bodies—ensures that there will always be other possibilities for categorizing phenomena and explaining them. An illustration is Cassiopeia A (Cas A) in the image above. Before modern instruments, astronomers found a few objects like Cas A: a ring of light around a central star. Since astronomical imagination was limited to mechanical explosions, the objects obviously were exploded stars. Few people doubted the accepted explanation that the ring of light was caused by limb brightening of a sphere of hot gaseous debris thrown off by the explosion. The puzzle to be solved was imagining a mechanism that could produce the astronomical amount of energy required to blast so much matter so far from the gravitational center with so large a velocity. Compared with the explosions that were imagined to cause ordinary novas and flares, these were super-explosions. The events were named supernovas and the rings were called supernova remnants (SNRs). It all made sense. Now modern instruments are bringing a rain of observations to sprout the seeds of overthrow. The ring is a cellular structure of plasma filaments. The filaments “flicker” over periods of about a year, and they emit cosmic rays and synchrotron radiation. They contain strong magnetic fields, and their velocities are too slow. Inside the ring are a disk and several jets composed of material that is enriched with such elements as silicon and iron. Many more objects like Cas A have been discovered, and the modern image has diverged from what was imagined. It is no longer a SNR. The libraries of explanation that burden the name of supernova are obsolete. A new name is required for the new phenomenon, and a new explanation must be imagined. Judging from similar objects that are observed at different angles, the ring of Cas A is a region of brightening in an hourglass-shaped interstellar Birkeland current as it pinches down to power the central star. In Cas A, we’re looking down the axis of the current. Discontinuities and leakage discharges generate webs of filaments with instabilities that flicker like lightning through clouds. In close-up views of the regions at upper left and near the center, the braided spiral structure of Birkeland-current filaments is apparent. In the video of images spanning several years, the braids appear to twist around each other. Bright knots of instabilities emerge and fade. Fluctuations in the currents generate double layers, and the strong electric fields act as particle accelerators. Electrons and ions are boosted to speeds that are comparable to that of light. The ions escape as cosmic rays; the electrons spiral in the magnetic fields of the filamentary currents and emit synchrotron radiation. Neutral atoms may be swept along with the ions and generate shock waves—in exactly the opposite causal relationship from what is imagined for SNRs. Nearer the center of the pinch, a toroidal (disk-like) current collects charge from the larger circuit. Occasional discharges produce narrow jets: because they are electrical currents that generate their own pinching magnetic fields, the jets tend to be self-collimating over long distances. The attractive force of the pinch effect in Birkeland currents causes them to act like cosmic vacuum cleaners: they sweep up surrounding material. The influx of that material depends on ionization potential. Where the outward gas pressure from the increasing concentration of material balances the inward transport, elements with that ionization potential build up. The process is called Marklund convection. It sorts elements into enriched regions, such as the iron and silicon concentrations in Cas A.
Flares are the result of double layers that form and explode in one or a few of the Birkeland currents in a star’s corona or photosphere. Those double layers arise from current surges that are generated in local instabilities. 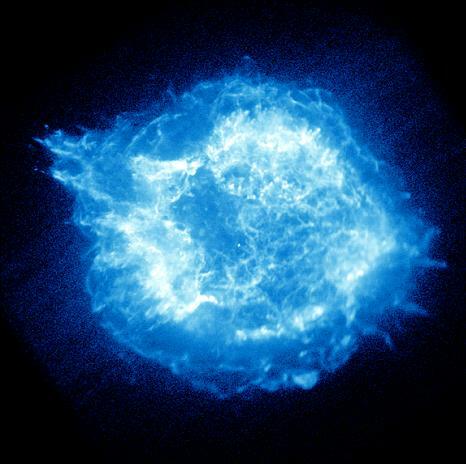 Novas and supernovas may be double layers that explode from the entire surface of a star. They are like cosmic sparks that “jump the gap” when instabilities switch off the current in galactic Birkeland filaments. The sudden interruption of current in such transmission lines will cause the energy that is distributed throughout the circuit to be dumped into the spark that bridges the gap. The resulting explosion will dissipate more energy than was originally present in the circuit element that “blew”—in this case, the star. The expansion velocities of these whole-star exploding double layers respond to the forces of the surging currents within them. Double layers explode more like a rapidly expanding balloon than like a firecracker: the force of expansion acts continuously in the layer instead of impulsively from an origin. Velocities cannot be treated as if they were the ballistic results of an initial explosion. They can speed up or slow down from moment to moment. This kind of non-ballistic behavior is typical of prominences and coronal mass ejections. That Cas A has velocities which are “too slow” for the estimated energy of a ballistic explosion is no surprise for an exploding double layer. Supernovas and their remnants were appropriate explanations for a universe that was imagined to consist of gas and gravity. But the past century revealed a universe that consists of plasma and electricity. Now we need explanations that are appropriate for it. Thanks to Wal Thornhill for his review and comments.